Nowadays, YouTube is more and more popular around the world. As we know, YouTube can be regarded as the most popular video-sharing website which provides us with a variety of videos. And more and more people tend to download YouTube video for offline enjoyment. In this case, the format and definition of videos downloaded from YouTube might not meet people’s requirement. Hence, people might consider downloading and converting YouTube video to other video formats in high definition that meet their requirement, such as HD mp4 format. HD video is defined as the video of higher resolution and quality than standard-definition. The experience of watching HD video is better than others. When you want to watch a video you saw on YouTube but you have no suitable devices but only have your TV and a Blu-ray player, and you might need to download and convert YouTube to HD for better enjoy videos without YouTube. And this post will introduce detailed guide on how to download and convert YouTube to HD effectively. Part 1. How to download YouTube videos? Part 2.How to convert YouTube to HD with Leawo Video Converter? Part 3.How to convert YouTube to HD with YouTube to HD video converter online? To convert YouTube to HD, it is recommended to download YouTube videos first. And there might be some people have no idea to download desired videos from YouTube. No worry, Leawo YouTube Downloader can help you. Leawo YouTube Downloader is a powerful video downloader that enable you to download videos from more than 100 video-sharing sites, including YouTube, Facebook, AOL, Dailymotion, etc at high speed. 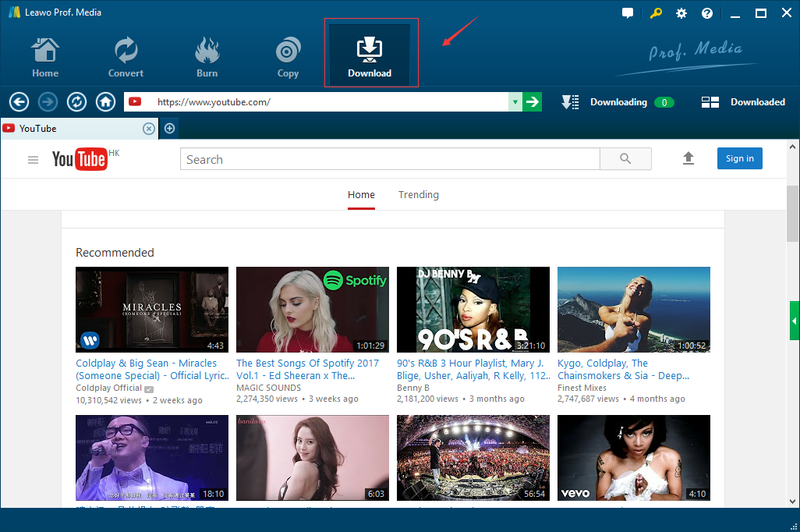 You can download and install Leawo YouTube Downloader and then follow the guide to download YouTube video step by step. Step 1: Launch Leawo YouTube Downloader, click “Download” tab at the top to enter the downloading panel where you need to paste URL of source video into the address box, and then click the green right arrow icon to load source video. Step 2: Click the little green triangle icon at the right, then you will see a panel where all videos available for download are listed. Choose one(s) and click “Download” icon to add video(s) to downloading queue. Step 3: After that, the downloading process will start and it will take a while to complete downloading process. 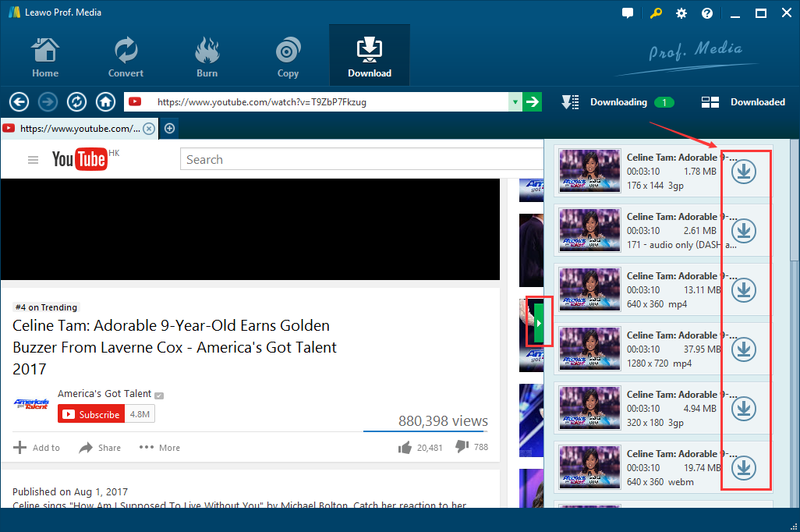 Here you can click “Downloaded” tab to check where all the downloaded videos are listed. 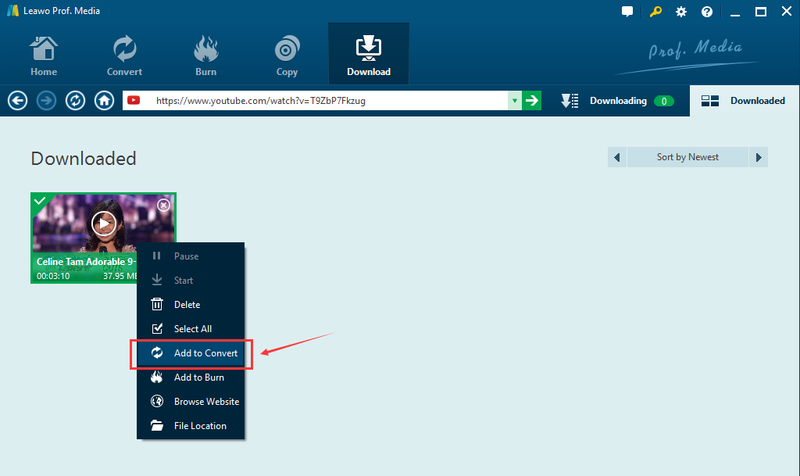 Step 4: Once downloaded, you can right click the downloaded YouTube video, choose “Add to convert” to add to video converter for ready to be converted to HD. Part 2. How to convert YouTube to HD with Leawo Video Converter? Step 2: Turn to drop-down box on the left of green “Convert” button. Click it and select the “Change” button to enter “Profile” panel. 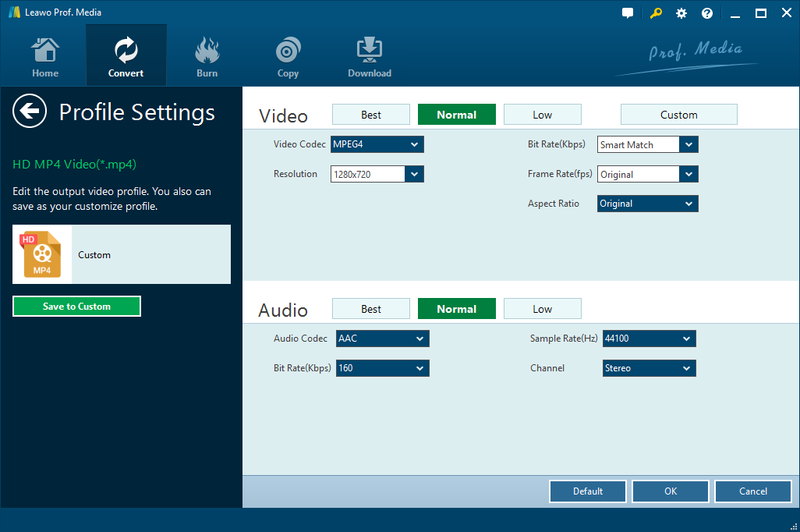 Then you can choose “HD MP4″ as the output format. Step 3: You can click “Edit” instead of “Change” on the drop-down box to set parameters of your vides including Video Quality, Video Codec, Video Resolution, Bit Rate, Frame Rate, Aspect Ratio, Audio Quality, Audio Codec, Bit Rate, Sample Rate, and Channel. Step 4: After all above done, click the green “Convert” button to set the output directory under “Save to” box in pop-up sidebar, and then click the other “Convert” button at the bottom to start to convert YouTube video to HD. Part 3. How to convert YouTube to HD with YouTube to HD video converter online? In addition to Leawo Video Converter, you can try other methods like YouTube to HD converter online. Search online you will find lots of such online converters like onlinevideoconverter, clipconverter.cc, Office Converter, Convert Files and so on. 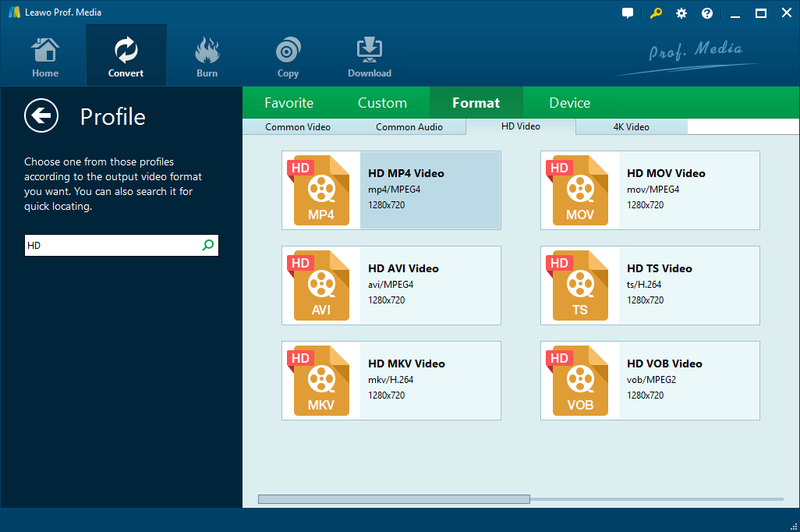 Such YouTube to HD converter online is convenient since you don’t need to download any other software or programs. Here I would like to take clipconverter.cc as an example to show you simple steps. Step 1. Paste your YouTube URL at ‘Video URL’ and press Continue. Step 2. Select HD (mp4) as the output format. Step 3. Press the ‘Start’ button at the bottom to start the conversion. Step 4. 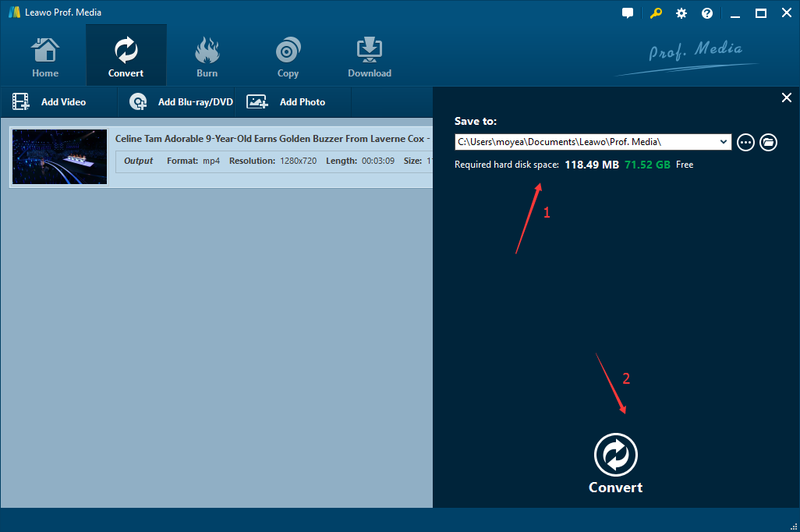 After the conversion is finished, you can download the converted file. The solutions listed above are all efficient for downloading and converting YouTube to HD. As for me, I prefer Leawo YouTube Downloader and Video Converter since it is efficient and convenient to download and then convert YouTube video to HD in high speed without quality loss. 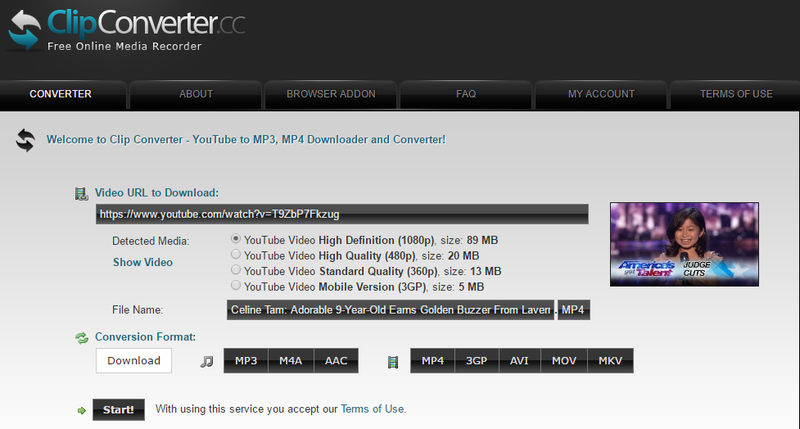 As for YouTube to HD converter online, you need more time to upload and download YouTube videos. Besides, the uploaded files has limit on its size. And you need to download the converted files once done. Therefore, by contrast, Leawo product is a better choice.